#1 Natural Health Trend You MUST Avoid! Is “raw” water worth the price? Raw carrots, apples, tomatoes and other uncooked plant-based foods are wonderful for your body. They’re loaded with fiber, antioxidants and digestive enzymes that support your health and digestive system. But should you drink “raw” water? This concept may sound like a joke. After all, unless you boil water for your coffee or tea, water doesn’t get cooked, does it? So how can it be “raw”? If you’re not familiar with the term, this type of water is the latest natural health trend in some groups. People are paying upwards of $15 a gallon for it. This might seem silly when you consider that it’s nothing more than natural spring water. But that’s not what people are shoveling out their hard-earned cash for. The big bucks are being spent on the fact that this water is untreated and unfiltered, which strikes me as being pretty ridiculous. You see, the bottlers claim untreated water retains natural minerals and probiotics that are good for you. They argue that bottled and tap water are “dead” waters, because these natural components are stripped out them. And a lot of folks are jumping on the bandwagon. But just because something is “natural”, it doesn’t mean it’s healthy. When water hasn’t been treated or sterilized, you have no idea what’s in it. It can contain all sorts of unhealthy viruses, parasites and bacteria, including feces and urine from deer and other wild animals. This means drinking untreated water, no matter how pristine the source, can potentially expose you to some nasty microbes like salmonella, E. coli, giardia and cryptosporidium and other pathogens. All of these can result in several diarrhea and cramping – and send you to the emergency room. The fact is, millions of people around the world drink untreated (raw) water every day. And they don’t pay a fortune for it. They drink it because they have to. Sadly, many of them die after consuming water that’s contaminated. On the other hand, it’s very easy to distrust water that comes out of your tap. And I don’t blame you. Public water supply systems throughout the U.S. are loaded with fluoride, fertilizers, pesticides, agricultural run off and industrial waste. Many of these chemicals are associated with cancer, diabetes, thyroid conditions, reproductive problems and other health disorders. Bottled water isn’t any better. The truth is, the FDA quality standards for bottled water are basically the same standards used by the EPA for tap water. Plus, much of the bottled water sold here in the U.S. comes from municipal water sources. 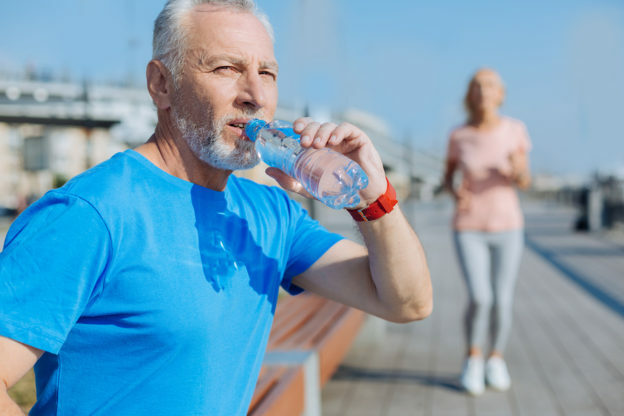 While the facts on drinking water may seem dismal, there are ways to ensure you’re drinking the safest, purest and healthiest water available to you – without paying an arm and a leg for it. I keep a big pitcher of water in my fridge at all times. It’s free of chlorine, fluoride, bacteria, heavy metals and other contaminants. I have a water distiller. It’s one of the best investments I’ve ever made. It removes about 99% of chlorine, fluoride, bacteria, pesticides, lead and other chemicals from my tap water. In other words, after a one-time investment, I have all of the pure, natural, healthy water I could ever want. Now, you might have heard that distilled water is devoid of minerals. And that’s one of the claims that raw water bottlers are using in their defense. But the truth is, you only get a small portion of your daily mineral intake from water. So this isn’t a big concern for me. However, if this worries you, I have a quick and easy solution. Just purchase a bottle of liquid minerals made especially for re-mineralizing distilled water. You can pick it up at any health food and supplement store or buy it online. It only takes a teaspoon full or two, and you have a very inexpensive source of mineral water without spending a fortune. Don’t waste hundreds of dollars a year on a “raw” water scam that could give you diarrhea, send you to the hospital or worse. And don’t spend another dime on bottled water that may not be any better than the water that comes out of your faucets. Your health is more important than that, and a distiller can give you contaminant-free water for years to come. Drinking Water Fact Sheet. World Health Organization. Last Updated Jul 2017. EWG’s Nationwide Tap Water Transparency Report is Here: New Database Details Pollutants in Virtually All U.S. Public Water Systems. Press Release. Environmental Working Group. Jul 2017. Ward, MH. Too Much of a Good Thing? Nitrate from Nitrogen Fertilizers and Cancer. Rev Environ Health. 2009 Oct–Dec; 24(4): 357–363. Are Your “Natural” Foods REALLY Natural? This entry was posted in Detoxification and tagged alternatives to tap water, best source for safe water, how much does raw water cost, is raw water bad for me, is raw water healthy, is water from a distiller safe, problems with untreated water, should I buy raw water, What is raw water on February 14, 2018 by Taylor Donnini.